Daaasssssss Keyboard has arrived! – Arbitrary Musings..
I’m really excited about my latest present. 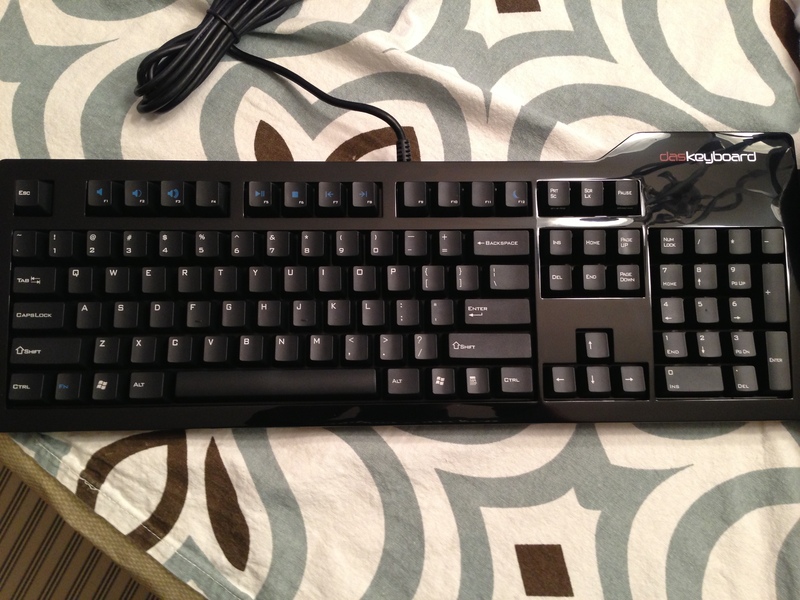 The Das Keyboard Professional S (Brown switch). The keyboard I have at work is just atrocious and I have been daydreaming about my favorite keyboard of all time an old IBM mechanical model. I forget the exact model, but boy if typing on it wasn’t a dream. So I ordered the Das Keyboard Pro S from http://amzn.com/B008PFDUW2 . I ordered the Cherry Brown switch for the quieter typing since I’ll be using this primarily in the office. I chickened out and got the Pro model because it has the indicator on the keys. The regular version is blacked out, which would probably be ok pretty quickly and keep folks off of my PC, but since I touch production I didn’t want to take an unnecessary risk… for now. I’ll probably end up getting that one for home eventually.. or convince my wife to get it for me. Speaking of which, she tried it out and asked for one too. She may steal it from me before I can get it into my office. In any case, the typing on it is *awesome*. I can’t wait to get to work on Monday! Previous Previous post: And it begins..